Obituary for William "Bill" George Sanders | Ralph F. Scott Funeral Home, Inc.
Kentucky Colonel William “Bill” Sanders died peacefully at his home in Portsmouth at the age of 90 on October 11, 2018. Bill was born to William and Georgia Bragg Sanders in Greenup County, KY on October 24, 1927. He spent his childhood and later raised his family in Portsmouth. Bill was a proud retiree of the Local 577 Plumbers and Pipefitters Union in Portsmouth and a World War II Navy veteran. He was awarded the American Campaign Medal, the Asiatic Pacific Campaign Medal and the World War II Victory Medal for his service. Bill always had an interest in performing and had the pleasure of showcasing his talent on many different platforms including radio, television, and stage as a country performer, actor, and director. 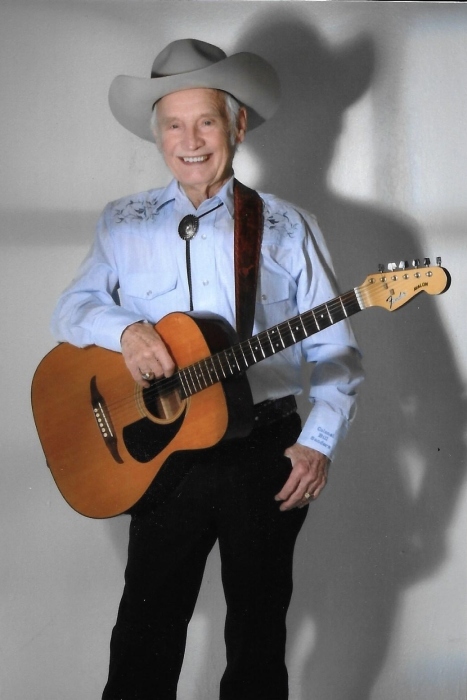 Country music performance was a passion for Bill and he was honored to be a member of the 140 Music Hall in Wheelersburg, 73 Jamboree in Henley, and the Southern Ohio Opry in Lucasville. Bill was inducted into the “Wall of Fame” at the Southern Ohio Opry. Bill was proud to be a founding member of the Roy Rogers Festival and enjoyed sharing stories of his friendship with Roy Rogers and Dale Evans. In fact, Bill had an entire chapter dedicated to him in the 2014 publication My Brother, Roy, which was written by Roy’s sister Cleda Slye Willoughby and Dr. John Roger Simon. Bill and his late wife Betty often traveled to California to visit Roy and his family. He was a member of the James Dickey Post #23 American Legion and Coles Boulevard Church of God. Bill was preceded in death October 16, 2005 by his dear wife of 58 years, Betty Ruth Wilburn Sanders, whom he married in Greenup, KY on September 14, 1946. He was also preceded in death by his parents; two siblings, Allered Sanders and Juanita Griffith; son-in-law Timothy Davis; and his grandson Billy Davis. Bill is survived by his daughters Jeanie Sanders Davis of Elizabethtown, KY and Judith (Timmie) Sanders Phillips of McDermott; four grandchildren, Kimberlie (William R.) Sparks of Fort Knox, KY, Kristina Phillips of Chicago, IL, and Jennifer (Yoshi) Phillips Inoue of West Chester; three great grandchildren, Erika Sparks Blair (Derik) of Ekron, KY, Timothy J. Hill (Ashley) of Lexington, KY and Tomi Inoue of West Chester; and four great-great grandchildren, Dominik Blair, Alyssa Blair, William Hill and Leo Hill. 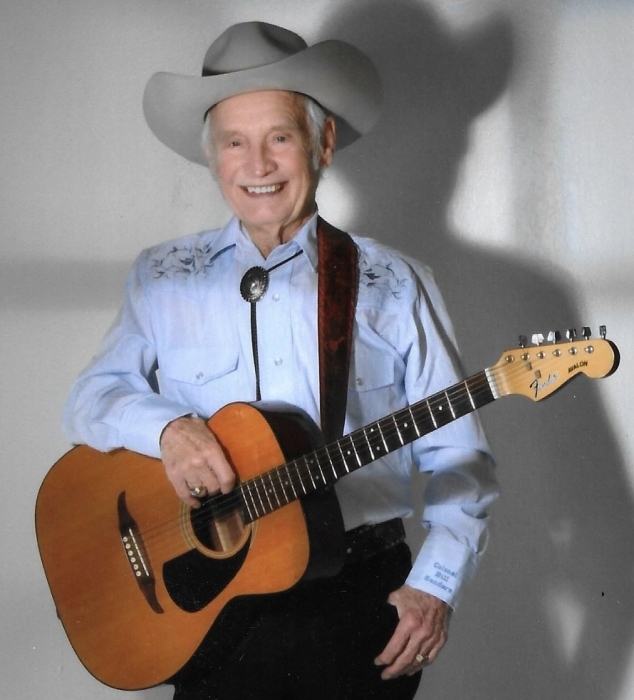 Bill was a proud country musician, a loving family man, and everyone’s friend. He will be sorely missed by all who knew and loved him. Funeral services will be held at 11 A.M. Tuesday at the Ralph F. Scott Funeral Home in Portsmouth with Pastor Chad Benner officiating. Interment will follow at Charter Oak Cemetery in Aberdeen where he will be laid to rest next to his late wife, Betty. The James Dickey Post #23 American Legion will provide military rites. The family will receive friends at the funeral home Monday from 5 to 8 P.M. and one hour prior to services Tuesday. 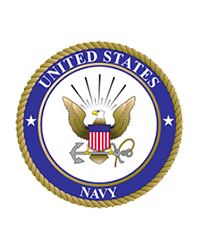 The flag of the U.S. Navy will fly at the funeral home in honor of Mr. Sanders’ service to our country.